All Saints’ Church has been one of the host churches for the Peterborough Night Shelter since the beginning of the project. It is run by Light Project Peterborough and in September we will be contacting volunteers and starting the preparation for the 18/19 season. We are seeking volunteers who could serve and support the homeless of Peterborough from 26th November 2018 until 18th March 2019. Of course, the more shifts the better. However, if you can only do an occasional shift we would still be very pleased to have you on the team. The night shelter will be primarily based on the Housing Justice rolling church model. Furthermore, 3 churches have come on board this year and will be undertaking a week long mission each to serve the homeless. 7 churches will be hosting for 13 weeks from the evening of December 10th through to the morning of 11th March. Furthermore, the 3 new churches that are coming on board and acting as hosts for 3 individual week blocks. Lastly, throughout the full 16 weeks of provision we meet and great our homeless guests with love, tea and often cake at a central meeting point. Evening Shift (approx. 6:00pm – 10pm) to set up the venue, cook the meal; greet guests and fellowship with them during the evening. Morning Shift (approx. 6.30am – 8:30am) to come in to prepare breakfast and then pack away the equipment restoring the venue to its normal state. 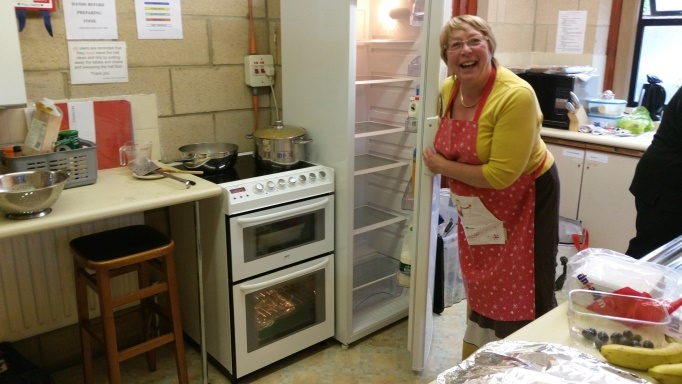 Central Meeting Place (6.15pm – 7.15pm) to welcome guests, serve hot drinks and fellowship with them until the transport to the host Church arrives at 7pm. ALL volunteers will need to receive some training prior to volunteering on the project. If you have previously volunteered with Peterborough Winter Night Shelter and have received training you do not need to attend, your team leader at the venue will offer a refresher. If you are new to the project or have not been able to attend previously please attend one of our newcomer events shown below. For those who are team leaders, it is requested that you attend a team leader training session. Closing date for application will be 31st October 2018, please mail on the below email and express your interest. Thank you for all your support. Very soon the winter of 2017/18 will be upon us! With this in mind we are preparing our Peterborough Winter Night Shelter for our third year of support for the homeless. Last year we supported 47 homeless guests to access warmth, love, good food and a comfy bed. Many of these were then supported into stable accommodation and are still fondly in our thoughts and prayers. We run the shelter with help from the many volunteers, churches, businesses and members of the public that kindly roll up their sleeves and offer support, a real team effort! And here we are again, we dont want anyone to have to sleep on the streets, and we want all to have an offer of a warm and stable home. Practical Donations – We purchase much of our bedding and linen but are always grateful to receive new or good quality second hand single duvet covers and pillow cases, single sheets, towels, toiletries (small sizes), disposable razors and men’s warm clothing underwear and socks. Volunteering – We will be in touch with all current volunteers in September with training dates and information. We have many different roles and without our many volunteers this project would not take place. You will get to meet some amazing people and have wonderful opportunities to make a difference in the lives of homeless people. Funding – The project costs approximatley £20,000 to run. We will have beds available every night from 11th December 2017 to 11th March 2018. This year we want to do more, being more active in meeting people before the start of the project and offering more follow up as they leave, so lots for us to do! If you are thinking about a fundraising event, consider using this page to publisice your event and do let us know! Any cash donations please email or contact via telephone to arrange collection. If you would rather put a cheque in someones hand than in the post please do get in touch. Pray – Please pray for the night shelter, there is much to do. We do want to keep learning and seeing lives changed for the better. Please pray for guidance, provision, protection and effectiveness in our work. Tell your friends about our shelter, and talk about homelessness. The more people we can get talking about this challenge the more likely we are to solve it! It has been three years since All Saints’ Peterborough started hosting Winter Night Shelter once a week during Winter. We are pleased to say that the PCC has decided to continue our journey with those who are homeless this year again. From December 2016 to March 2017, Winter Night Shelter provided 512 beds. 47 different guests stayed one night or more. More than 200 volunteers, Christians from 7 different churches and non-Christians gave about 6,700 hours of their time in total. At end of the project, 6 guests were able to move into Private Rented, 1 guest moved into the purchased accommodation, 14 guests moved into the accommodations in New Haven and YMCA. All Saints’ is not a mega church with hundreds of thousands of congregation. So is other churches who took part in Night Shelter Project. But this gave us an advantage. Thanks to that we were the churches around the local area within the same rage of size, we could work together in harmony and in balance. We weren’t quite sure though where it would take us when we took our first step into the project. Undoubtedly there were some concerns about it. Not just about how we are going to have enough provisions and volunteers but also about how our communal life in All Saints’ will be affected by this project. There were plenty of things to worry about by which we could have let us to be deterred. However we took the first step trusting that this is what God calls to do. And that is when we started to see God’s hand working with us and through us. We saw so many generous helping hands around us throughout the project. So many people donated so many things with which we enjoyed our dinner and breakfast together at the table, sharing fellowship and love with our guests. It can be often disheartening to read the newspapers or watch the news because the world seems to have lost kindness and generosity while selfishness and ignorance prevails. But kindness and generosity were right there around our lives, waiting to be called upon by us, by Christians. Through Night Shelter we saw All Saints’ has become more than an old building that costs a lot but a house which invites and encourages the generous, kind spirit in our community, embodying our common values both as Christians and neighbours. For 3 weeks during May All Saints Church, Peterborough worked alongside 7 other churches in the city to trial a Night Shelter. During that time 90 beds were provided, 14 individual guests were served, and 137 volunteers took part. Four guests moved into their own more sustainable accommodation, 1 started a full-time job and 2 were actively engaging with the Council who were confident of being able to help them with accommodation. It was wonderful to see that many opportunities were created for people from different Churches to serve together. And there were great ecumenical opportunities for Church Leaders to serve together. Following the success of the May trial the host churches have decided to continue with the winter provision. We are planning for the Night Shelter to run from 5th December to the end of February. This means that at All Saints will be hosting up to 8 guests every Friday night who would otherwise be sleeping without a roof over them at this cold time of year. We will provide hospitality and friendship, a hot evening meal & a place to sleep and then breakfast, before transport is provided back to the city centre. Six other churches will be doing the same. 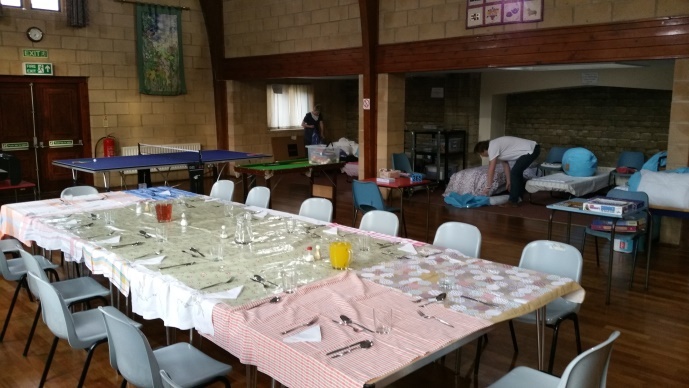 Set up the hall / prepare & serve food (evening meal and breakfast) / share time with the guests over a game of Scrabble or a cup of coffee / do the ‘overnight’ shift / help clear away and clean up at the end of the session. Training will be offered on Saturday 7th and 21st November as well as some evening shorter courses. The Night Haven will assess guests and provide our referrals together with assistance with logistics and co-ordination. Throughout the history of Christianity church communities have been providing hospitality and shelter for those in spiritual or material need. At one level this has been demonstrated by Christians showing love for their neighbour and on a larger scale through monastic houses and charitable and humanitarian causes. The Night shelter follows in this tradition and results from Christians feeling moved to respond to those who sleep in our parks and on our streets.